1. Department of Cancer Systems Imaging, The University of Texas MD Anderson Cancer Center, Houston, TX 77054, USA. 2. Department of Interventional Radiology, The University of Texas MD Anderson Cancer Center, Houston, TX 77030, USA. 3. Department of Interventional Radiology, Chinese PLA General Hospital, Beijing 100853, China. Pancreatic ductal adenocarcinoma (PDAC) accounts for over 90% of all pancreatic cancer. Nanoparticles (NPs) offer new opportunities for image-guided therapy owing to the unique physicochemical properties of the nanoscale effect and the multifunctional capabilities of NPs. However, major obstacles exist for NP-mediated cancer theranostics, especially in PDAC. The hypovascular nature of PDAC may impede the deposition of NPs into the tumor after systemic administration, and most NPs localize predominantly in the mononuclear phagocytic system, leading to a relatively poor tumor-to-surrounding-organ uptake ratio. Image guidance combined with minimally invasive interventional procedures may help circumvent these barriers to poor drug delivery of NPs in PDAC. Interventional treatments allow regional drug delivery, targeted vascular embolization, direct tumor ablation, and the possibility of disrupting the stromal barrier of PDAC. Interventional treatments also have potentially fewer complications, faster recovery, and lower cost compared with conventional therapies. This work is an overview of current image-guided interventional cancer nanotheranostics with specific attention given to their applications for the management of PDAC. Keywords: Interventional oncology, photothermal ablation, irreversible electroporation, nanoparticles. Pancreatic cancer is the fourth-leading cause of cancer death in the United States and will become the second by 2030 . Pancreatic ductal adenocarcinoma (PDAC) accounts for over 90% of all pancreatic cancer. PDAC is a devastating malignancy with an extremely poor prognosis. The median survival duration is less than 6 months after diagnosis, and the 5-year overall survival rate is less than 7% [2, 3]. PDAC grows rapidly, metastasizes early, and is generally accompanied by notable resistance to adjuvant therapeutic strategies . Few patients meet the criteria for curative resection because most are diagnosed with advanced-stage disease. Palliative chemotherapy and radiotherapy remain the only treatment options for most patients with inoperable PDAC. These therapies offer only limited efficacy because PDAC frequently relapses, has multidrug resistance, and has low radiosensitivity [5-7]. Radically new agents and strategies are desperately needed for the management of inoperable PDAC. Research in the field of nanomedicine and nanotechnology for the diagnosis and treatment of cancer has undergone unprecedented expansion in recent years . Cancer nanotheranostics, which aims to combine imaging and therapy using nanotechnology, is at the forefront of biomedical research owing to the unique biological properties of the nanoscale effect as well as the multi-functional capabilities of nanomaterials [9, 10]. Over the past 3 decades, tremendous research efforts have led to many advanced nanoplatforms [11, 12]. Multimodality treatments have been integrated into single nanoparticle (NP) systems [13, 14], with cytotoxic agents and/or tumor-targeting moiety either loaded onto the surface, entrapped inside, or dissolved within the matrix of NPs in order to achieve preferential accumulation within the tumor cells, overcome drug resistance, and exert unique functions such as photothermal conversion, radiosensitization, drug transport, and contrast for imaging [15, 16]. Although promising results have been reported with NP-mediated cancer theranostics, inefficient delivery, inherent toxicity, off-target effects, unfavorable biological distribution, and lack of clearance from the systemic circulation are still major restrictions that hinder the clinical translation of advanced nanoplatforms . Among these obstacles, the inability to deliver NPs through a solid tumor mass remains the key impediment to bridging the gap between laboratory and clinical use [18, 19]. The accumulation of NPs predominantly in the tumor increases the effectiveness of therapy while reducing systemic side effects and minimizing damage to surrounding normal tissues. After intravenous injection, most NPs localize predominantly in the mononuclear phagocytic system . The enhanced permeability and retention effect (EPR), which plays a major role in the deposition of NPs in solid tumor, is largely determined by the permeability of tumor vessels, as well as by the physicochemical and pharmacological properties of the NPs, i.e., the particle size, circulation half-life, etc. [21, 22]. However, tumor delivery of NPs via the EPR effect alone is not very efficient, especially in hypovascular tumors such as PDAC [23, 24]. In addition to hypovascularity, other microenvironmental characteristics can impede drug delivery to PDAC. Including high stroma density and high interstitial fluid pressure . Image-guided interventional techniques in combination with multi-functional NPs may offer some solutions to these problems. Interventional oncology includes a variety of minimally invasive, real-time image-guided procedures for the diagnosis and treatment of cancer and is generally associated with fewer complications, faster recovery times, and lower costs compared with surgery [26, 27]. Interventional techniques enable regional drug delivery, targeted vascular embolization, and direct ablation of tumors. Here, we provide an overview of the current interventional cancer nanotheranostics, with specific attention drawn to their applications for the management of PDAC. The unique optical, chemical, magnetic, and/or photoacoustic properties of nanoscale materials permit the creation of NP-based imagable probes with targetability and multi-functionality across multiple imaging modalities . Examples of such NP-based imaging probes include radiolabeled NPs for single-photon-emission computed tomography (SPECT) and positron emission tomography (PET), magnetic NPs used as a contrast agent for magnetic resonance imaging (MRI), plasmonic NPs for photoacoustic imaging (PAI), radiopaque NPs for X-ray/computed tomography (CT) imaging, fluorescent NPs for near-infrared optical imaging, and echogenic NPs for ultrasound imaging. Multiple imaging modalities are frequently combined into a single nanostructure to exploit the advantages of each imaging modality for more accurate interpretation of the tumor anatomy and any other abnormality. Linking gold NPs (AuNPs) with other contrast agents has been a commonly used approach for multimodality imaging. AuNPs can exhibit tunable optical absorption, scattering properties, and strong absorption of X-rays, properties that make them suitable for various imaging techniques, including PAI, surface-enhanced Raman scattering (SERS) imaging, and X-ray and CT imaging . Au-Fe NPs have been used for MRI, CT, and SERS imaging . Gold-silica-based NPs coated with Gd3+ ions enabled triple-modality MRI/PAI/SERS imaging to delineate the margins of brain tumors in living mice both preoperatively and intraoperatively . Other multi-functional nanoplatforms investigated extensively in recent years for nanotheranostic applications include copper-based NPs and superparamagnetic iron oxide NPs (SPIO-NPs) . Copper oxide NPs were investigated as contrast agents for dual-modality MRI and ultrasonography , manganese (II) chelate functionalized copper sulfide (CuS) NPs were used for MRI/ PAI , and 64Cu-labeled CuS NPs were used for PET/PAI [34, 35]. SPIO-NPs can be used as an MRI contrast agent to provide a soft tissue signal with morphological and anatomical information. When cross-linked with near-infrared fluorescence (NIRF) dye, the SPIO-NPs can be imaged by both MRI and NIRF imaging . SPIO-NPs radiolabeled with 68Ga were used for dual-modality PET/MRI , and SPIO-NPs radiolabeled with 99mTc-dipicolylamine-alendronate were used for SPECT/MRI . Resovist, and Feridex are approved by the U.S. Food and Drug Administration (FDA) as SPIO contrast agents for MRI of liver tumor. Although these nanoplatforms are promising for the imaging of solid tumors in general, none has been successfully used for in vivo imaging of PDAC in patients. The cancer therapeutic capabilities of NPs can be realized by either using them to activate the release of anticancer drugs or by taking advantage of the inherent physicochemical properties of NPs to generate tumor-ablating heat under various external stimuli. A variety of therapeutic agents, including chemotherapy and radiotherapy agents, photosensitizers, and small- interfering RNA (siRNA) etc., can be encapsulated in NPs and delivered to tumors for anticancer therapy . Different forms of NPs have been investigated as drug delivery vehicles. For example, doxorubicin-encapsulated liposome was the first FDA-approved nanotherapeutic agent used in the clinical to treat solid tumors . An Au-siRNA complex was used in a phase I clinical trial to silence anti-ribonucleotide reductase in patients with metastatic melanoma . A lipid NP formulation of siRNAs was used to target vascular endothelial growth factor and kinesin spindle protein simultaneously in patients with advanced cancer and liver metastases . And poly(L-glutamic acid)-paclitaxel conjugate is currently undergoing clinical phase III studies . Photothermal-converting NPs can turn light energy into heat to ablate cancer cells, and magnetic NPs can convert magnetic frequency into hyperthermia for magnetic fluid hyperthermia of cancer cells. Nanoparticles can also be designed to not only generate localized heat for tumor ablation, but also trigger drug release to further enhance the therapeutic efficacy. For example, doxorubicin was loaded to polyethylene glycol (PEG)-coated hollow gold nanospheres (HAuNS) to mediate simultaneous photothermal ablation (PTA) and chemotherapy of cancer cells [44-46]. Owing to their strong absorption of near-infrared (NIR) light, HAuNS can also be used for PAI. Combining HAuNS with 64Cu enabled the noninvasive imaging of HAuNS delivery to and retention in solid tumors using both PAI and PET [44, 47]. These and many other multifunctional theranostic NPs provide much-needed tools for interventional nanotheranostics of PDAC. Nanomedicine for the treatment of PDAC has gained considerable attention and had notable success in recent years. Abraxane (albumin-bound paclitaxel-containing NPs) is FDA-approved for treating metastatic PDAC in combination with gemcitabine . Onivyde (irinotecan liposome injection) has recently been approved by the FDA for treating relapsed PDAC in combination with leucovorin and fluorouracil . Rexin-G, a nonreplicative-targeted retroviral vector, has entered clinical phase I/II studies. Rexin-G is described as a pathotropic nanoparticle (~100 nm in diameter) bearing a cytocidal dominant-negative cyclin G1 construct. Preliminary results showed that Rexin-G may prolong survival in gemcitabine-resistant PDAC . In preclinical studies, irinotecan delivery by lipid-coated mesoporous silica NPs has shown improved efficacy and safety over irinotecan liposome injection in an orthotopic Kras-derived mouse model of PDAC . Examples of nanomedicines for the treatment of pancreatic cancer are shown in Table 1. Examples of Nanomedicines in Clinical Trials for Pancreatic Cancer Treatment. Interventional treatments delivered locally to directly damage cancerous tissues have been shown to be associated with reduced infection rates, quick recovery, and shortened hospital stays. Local-regional tumor ablation and embolization, e.g., image-guided irreversible electroporation (IRE) and nanoelectroablation, radiofrequency ablation (RFA), microwave ablation, cryoablation, trans-arterial chemo-embolization and/or radio-embolization, and endoscopic ultrasonography (EUS)-guided delivery and therapy, have been reported as options for treating advanced-stage PDAC patients [77, 78]. But these interventional treatments are more likely to be used to help prevent or relieve cancer symptoms and are often used along with other types of treatments. Interventional nanotheranostics incorporates the use of NPs with interventional treatments to improve anticancer efficacy by delivering drugs, enhancing chemo- and radiosensitivity, increasing tumor uptake of treatment agents, and mediating thermal effects, and thus potentially improving outcomes for patients with PDAC. Transarterial nanoembolization involves the delivery of multifunctional NPs and embolic agents directly to tumor vessels under real-time image guidance [79-81]. This technique is expected to result in superior efficacy compared with chemoembolization or radioembolization because NPs can deliver multiple cytotoxic agents, radionuclides, immune modulators, and gene products in various combinations to the tumor and can be used simultaneously with various tumor ablation techniques. Preclinical studies of transarterial nanoembolization in hepatocellular carcinoma have shown the effectiveness of this approach [23, 47]. Fig. 1 shows high tumor uptake of AuNPs after transarterial nanoembolization in a rat model of hepatocellular carcinoma . These data suggest that nanoembolization of metastatic pancreatic tumor in the liver or hepatocellular carcinoma metastasis in the pancreas should be explored in future studies. Eifler et al. conducted a preclinical study in 12 rabbits bearing VX2 tumors in the pancreas. AuNPs surface functionalized with anti-sense oligonucleotides to target molecular mechanisms of PDAC were delivered via the gastroduodenal artery with Lipiodol, a radiopaque poppyseed oil used in chemoembolization applications. Forty two- and 89-fold increases in the uptake of AuNPs in the periphery and core of the pancreatic tumors were achieved, respectively, compared with the group that received AuNPs intravenously. In our preliminary study with N1S1 liver tumors growing in the pancreatic head of Sprague-Dawley rats, doxorubicin combined with HAuNS/Lipiodol injected via the gastroduodenal artery showed extremely high tumor uptake (Fig. 2). These successes, however, may not be readily extended to PDACs. The main limitation of using trans-arterial nanoembolization for PDAC is the poor and relatively complex blood supply of PDAC. Approximately 78% of PDACs occur within the head of the pancreas , and the blood supply of these tumors typically relies on the branches of the gastroduodenal artery and the superior mesenteric artery. Other interventional treatments such as IRE, PTA, and high-intensity focused ultrasound (HIFU), as well as chemotherapeutic agents, may be combined with nanoembolization to disrupt the stromal barrier and increase the blood perfusion and permeability of PDAC to enhance the penetration of theranostic NPs inside the tumor . 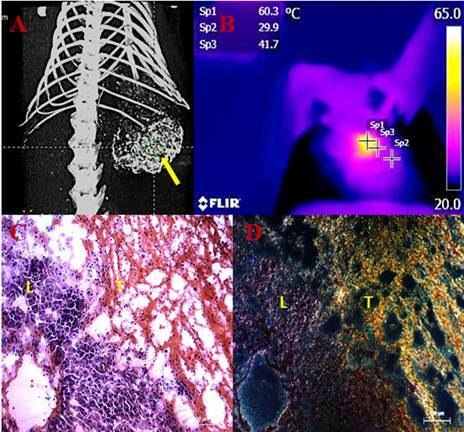 Transarterial nanoembolization of heptocellular carcinoma using gold nanoparticles (AuNPs)/Lipiodol for imaging guided photothermal ablation (PTA) of the tumor. A: AuNPs/Lipiodol accumulating in the liver tumor (yellow arrow) after intraarterial injection enabled µCT imaging guided PTA. B: Near-infrared (NIR)-camera recorded a rapid elevation of local temperature up to around 60˚C in the tumor under NIR laser exposure. C: Hematoxylin and eosin staining of the liver and tumor intersection after NIR laser exposure. Massive tumor necrosis was induced after PTA while the adjacent liver appears normal. D: Dark-field microscopy of the same slide revealed that a high concentration of Au accumulated in the necrotic tumor area (T) whereas much less was in the liver (L). Transarterial nanoembolization of hepatocellular carcinoma pancreatic metastases in rats using doxorubicin combined with hollow gold nanospheres (HAuNS) and Lipiodol. A: Doxorubicin fluorescence of 2-mm section of the pancreatic tumor. B: Hematoxylin and eosin staining section showing the pancreas and tumor. C: HAuNS accumulated predominately in the tumor but much less in the pancreas in dark-field microscopy. 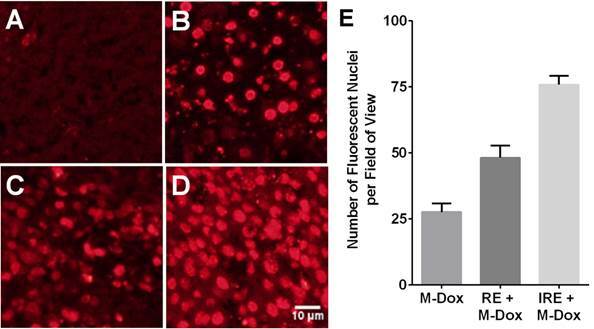 D: Doxorubicin distribution matches well with HAuNS in fluorescence microscopy. RFA uses radiofrequency current passing through electrodes to generate hyperthermia sufficient to ablate cancer cells. Needle electrodes are placed into the tumor under imaging guidance during the RFA procedure. Combining RFA with NPs has resulted in greater cancer cell killing efficacy compared with RFA or NPs alone in several studies . The EPR effect of NPs can be strengthened, either by the hyperthermia or the altered tumor microenvironment, during RFA. Tumor cell sensitivity to NP-mediated chemotherapy or radiotherapy also can be enhanced by RFA-generated hyperthermia . Metal or carbon NPs can absorb radiofrequency energy and release heat. AuNPs conjugated with cetuximab, an antibody directed at epidermal growth factor receptor, showed enhanced cellular uptake in Panc-1 cells, resulting in increased Panc-1 cell death with RFA . However, to date, RFA combined with NPs has not been utilized in orthotopic preclinical models of PDAC or in the clinic. IRE represents a novel application of nanotechnology for the non-thermal ablation of cancer cells . During the procedure, IRE probes are percutaneously inserted around a tumor under ultrasound or CT imaging guidance. IRE then induces a series of unipolar electric pulses in the plasma membrane of cancer cells. The increase in transmembrane potential creates multiple lethal nanopores in the cell membrane and leads to instant irreversible apoptotic cell death . Thus far, IRE has received the most attention as an interventional approach for PDAC, and is being actively investigated as a new treatment option in preclinical and clinical studies [91-95]. In a preclinical study consisting of 40 mice bearing orthotopic human PDAC, complete tumor ablation was demonstrated in 25% of the IRE-treated mice. In addition, the overall median survival time increased from 42 days for the untreated control mice to 88 days for the IRE-treated mice, and no pancreatitis was observed . The effectiveness of IRE for treating patients with locally advanced PDAC was first reported in a prospective multi-institutional pilot study . All 27 patients who received IRE demonstrated temporary elevation of blood amylase and lipase levels, but these returned to normal within 72 hours post-procedure. All patients experienced successful ablation of the tumor mass without recurrence within 90 days of follow-up, without clinical pancreatitis or fistula formation. In a multi-institutional evaluation of 54 patients who underwent IRE for advanced PDAC, significant improvements were achieved compared with patients receiving standard therapy . For IRE versus standard therapy, the local progression-free survival durations were 14 vs. 6 months (p = 0.01) and the overall survival durations were 20 vs. 13 months (p = 0.03). IRE in patients with unresectable PDAC appears to be safe . Two of the 14 patients studied showed either anesthesia-related spontaneous pneumothorax or pancreatitis (both recovered completely), and no IRE-related deaths occurred. Because tumor cells may be exposed to insufficient electrical field strength during IRE, efforts have been made to combine IRE with drug-loaded NPs. The premise is that the formation of nanopores in the cell membrane during IRE would increase the uptake of NPs in tumor cells. In a mouse xenograft model of subcutaneous heptocellular carcinoma, tumors treated with reversible electroporation (RE) or IRE and doxorubicin-loaded polymeric micelles NPs showed increased uptake of NPs and greatest percentage of necrotic area, compared with monotherapies (Fig. 3) . These effects of combining the delivery of nanomedicine with IRE treatment observed in hepatocellular carcinoma should be applicable to PDAC. Reversible electroporation (RE) and irreversible electroporation (IRE) increase the tumor uptake of doxorubicin-loaded polymeric micelles (M-Dox) in vivo. (A) Untreated control, (B) M-Dox, (C) RE + M-Dox, (D) IRE + M-Dox. (E) Quantitative results from different groups (with permission from reference 98). Unlike IRE, which uses microsecond pulses and low electric fields, nanoelectroablation uses nanosecond pulses and high-voltage electric fields to electroporate tumor cells. Nanoelectroablation triggers apoptosis by transiently creating nanopores in the cell membrane. It is thought that nanoelectroablation-induced apoptosis may stimulate activation of the immune response . Given the non-thermal nature of IRE and nanoelectroablation, the extracellular matrix and vascular and ductal structures can be relatively preserved; therefore, the risk of potentially life-threatening side effects such as the inflammatory cascade of acute pancreatitis and acute massive hemorrhage of the liver are minimized compared with other conventional thermal ablation techniques. Nanoelectroablation has also been explored in animal experiments and a pilot clinical trial for treating basal cell carcinoma . Nuccitelli et al. investigated nanoelectroablation in a murine xenograft model of human Capan-1 pancreatic cancer. Eighty-nine percent of the nanoelectroablation-treated mice exhibited complete tumor regression without recurrence. Mice treated with nanoelectroablation survived 9 to 10 months after treatment, while the untreated control mice died due to tumor overload within 4 months. These studies indicate that percutaneous nanoelectroablation is feasible and safe for patients with PDAC. The principle behind PTA is that photoenergy can be converted into heat energy to create hyperthermic effects and induce targeted cell damage [33, 44]. 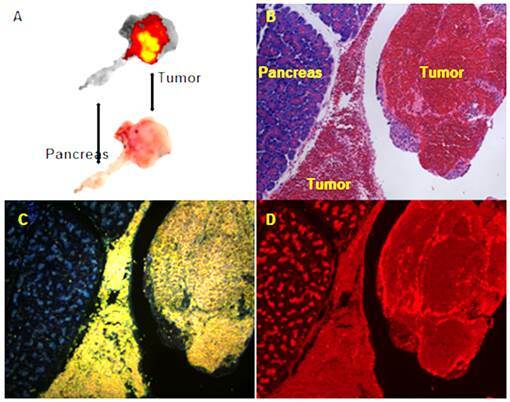 Imaging-guided, minimally invasive PTA has been used as a palliative treatment for inoperable pancreatic tumors in preclinical and clinical studies [101-103]. Due to their superior surface plasmon resonance, easily modified surface, and amenability to bioconjugation, AuNPs are highly efficient photothermal converters that have been actively explored with the goal of increasing PTA efficiency [10, 46]. In an in vitro study, cultured Panc-1 cells in the presence of 50 μg/mL of iron-oxide core/gold-shell NPs had their temperature increased to 79.5°C when exposed to an NIR laser. Cell proliferation was reduced to 2.3% and 47% of the original level in laser-irradiated and non-irradiated control cells, respectively, at 24 hours post-treatment. In addition, cellular uptake of these NPs could be seen on MRI . Mocan T, et al. studied the PTA effects of PEGylated multi-walled carbon nanotubes on Panc-1 cells and the mechanism by which they induced cellular apoptosis. These authors also developed human albumin functionalized multi-walled carbon nanotubes (HAS-MWCNTs) that could induce selective photothermal ablation of pancreatic cancer under laser irradiation . In that study, surgically resected specimens from patients with pancreatic cancer were preserved ex vivo and infused intra-arterially with HSA-MWCNTs via the greater pancreatic artery under ultrasound guidance. External laser irradiation of the specimen produced extensive necrosis of the tumor tissue without any harmful effects on the surrounding healthy parenchyma. These findings suggest that PTA may be effective in the treatment of PDAC. However, further studies are needed to assess the utility of NP-mediated PTA for treating PDAC in appropriate animal models, including orthotopic and transgenic PDAC models that have histopathological features closely resembling PDAC in human patients. The possibility of acute pancreatitis during PTA should be also critically assessed. Photodynamic therapy (PDT) uses ultraviolet/visible light at specific wavelengths to activate a photosensitizer that generates cytotoxic reactive oxygen species that can cause cellular apoptosis and necrosis . The photosensitizer or ultraviolet light alone is minimally toxic and non-ionizing, making PDT a safe and selective way to eradicate target tissue while sparing surrounding non-target tissues. Several clinically approved photosensitizers are currently being investigated in the clinic for PDT of cancers including pancreatic cancer . Photosensitizing molecules have been attached to NPs to improve tumor targeting, protect the photosensitizer from deactivation, and modulate the generation of reactive oxygen species [107, 108]. In addition, photosensitizer-containing NPs have been frequently combined with imaging agents or tumor targeting agents [105, 107, 109]. Yu et al. encapsulated a photosensitizer using amphiphilic sodium alginate-derivative NPs and tested their PDT effects in Panc-1 human pancreatic cancer cells. Under ultraviolet irradiation, the high level of reactive oxygen species generated by the treatment resulted in strong phototoxicity and apoptosis. However, PDT has the major limitation of the short tissue penetration depth of ultraviolet or visible light, so the role of PDT for treating PDAC remains to be determined. HIFU is a hyperthermia therapy that transforms high-frequency focused acoustic energy into heat to ablate tumors. Imaging guidance is usually used to plan and perform HIFU. Clinical trials investigating the effectiveness of HIFU for the treatment of pancreatic cancer  are under way. Because the increased local temperature may elevate tumor permeability, recent research has focused on the role of HIFU in improving drug delivery and triggering the release of drugs from nanocarriers . NPs carrying extrinsic contrast agents such as MRI contrast agents may enable MRI imaging within the tumor that allows for dose quantification to optimize HIFU treatment . In an interesting study, HIFU was shown to cause tissue cavitation and enhance the tumor delivery of doxorubicin intravenously injected into KPC (KrasLSL.G12D/+; p53R172H/+; PdxCretg/+) transgenic mice with spontaneous PDAC that have dense stroma and poor blood permeability . Ultrasound has also been shown to enhance the delivery of NPs and microparticle drug carriers. Tinkov et al. observed a 12-fold higher concentration of doxorubicin in a subcutaneous PDAC model in rats after intravenous injection of doxorubicin-loaded microbubbles. Rapoport et al. used HIFU to mediate the delivery of paclitaxel-loaded nanodroplets in a subcutaneous PDAC model in mice. In that study, HIFU was applied under MRI guidance in both continuous wave and pulsed wave modes at a sub-ablative energy level. The continuous wave mode had higher drug delivery to tumor cells than the pulsed wave mode, and this was accompanied by better tumor ablation effects. The ultrasound parameters and timing of the NP injections will need to be optimized to improve the therapeutic effects of HIFU combined with NPs. Endoscopic technologies include a variety of interventional imaging modalities such as endoscopy, narrow band imaging, autofluorescence imaging, confocal laser endoscopy, optical coherence tomography, endocytoscopy, endoscopic retrograde cholangiopancreatography (ERCP), and EUS . Endoscopic imaging techniques are useful for the in vivo morphological and cytological diagnosis of digestive tract malignancies . ERCP has become the primary imaging technique used in bile duct cancer and PDAC, and EUS and EUS-guided fine needle aspiration have been widely used in the clinic for the theranostics of PDAC. EUS is the most accurate imaging modality for PDAC and combining EUS with NPs has great potential to conveniently deliver local therapeutic agents to PDAC under imaging guidance. For example, a recent multi-center study using EUS-guided endoscopic injection of carbon pellet NPs in T1-2 colorectal cancer patients has shown success in improving the sensitivity and specificity of tracking lymph node metastases . Anticancer agents such as tumor necrosis factor-α that were injected intratumorally under the guidance of EUS have shown tumor suppression effects in patients with PDAC . ONYX-015 is a nano-size adenovirus with E1B 55 kDa gene deletion. The virus particles were engineered to selectively replicate and kill cells that harbor p53 mutations. Intratumoral EUS-guided injection of ONYX-015 into unresectable PDACs was shown to be feasible and was well tolerated in a phase I/II trial . EUS-guided interventional therapies such as RFA and PDT were also investigated in preclinical animal models [121, 122]. Studies that combine nanomedicines with EUS for the theranostics of PDAC are also a promising future research area. Although interventional techniques have been successfully applied clinically for the effective treatment of various cancers, at present, the role of loco-regional interventional procedures in advanced PDAC is limited. It is increasingly recognized, however, that some interventional procedures offer promising treatment options for patients with PDAC. For example, for patients with locally advanced PDAC, IRE has demonstrated value. HIFU is another technique that may be combined with a novel drug delivery system to increase the tumor delivery of therapeutic agents or NPs. NP-mediated interventional procedures have shown that they can selectively localize heat tumor and thus potentially enhance the effectiveness of targeted treatment of PDAC. Due to practical obstacles (e.g., some interventional techniques for small animal experiments require specific micro-surgical techniques and equipment), not all interventional technical options have been combined with NPs for theranostics of PDAC in preclinical settings. In addition, incomplete treatment and high recurrence rates are the most common limitations of current interventional treatments. In particular for PDAC, thermal based techniques such as RFA, PTA, and HIFU may have a high risk of inflammatory response. The potential effect of heat on the induction of pancreatitis also remains to be resolved. Limited data are available on the long-term treatment outcomes of thermal-based interventional procedures. Future efforts should be dedicated to developing tools that will increase the target-to-nontarget uptake ratio for NPs to maximize therapeutic efficacy and minimize adverse effects. The ideal NPs should be accurately and selectively deposited into the target tissue with minimum nonspecific distribution, i.e., they should be clearable from the systemic circulation instead of accumulating into off-target sites. We recently reported an ultra-small, renal clearable, photothermal-conducting system based on CuS NPs . These polyvinylpyrrolidone-coated, NPs are expected to be deposited into the tumor at much higher tumor-to-target organ ratios than most other NPs after intra-arterial delivery because the majority of these NPs are excreted in the urine instead of being taken up by the Kupffer cells in the liver and gastric system. It is anticipated that NPs with such characteristics may soon play a large role in combined NP-interventional techniques for the theranostics of PDAC. We thank Dawn Chalaire for editing this manuscript. This work was supported in part by the Odyssey Program and H-E-B Award for Scientific Achievement at MD Anderson Cancer Center (to JL), by the National Institutes of Health grant R44 CA196025, and by the John S. Dunn Foundation. 62. Combination therapy with NC-6004 and gemcitabine versus gemcitabine alone in pancreatic cancer. https://clinicaltrials.gov/ct2/show/NCT02043288. Corresponding author: Department of Cancer Systems Imaging-Unit 1907, The University of Texas MD Anderson Cancer Center, 1881 East Road, Houston, TX 77054, Tel: +1-713-792-5182 Fax: +1-713-794-5456 E-mail: cliorg.